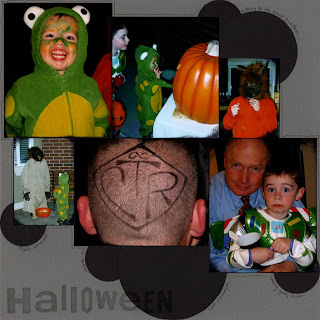 ... with Halloween 2005! It has taken literally months to get through my layouts for ONE SINGLE HOLIDAY! But I'm okay now. The page is done and I like it. I didn't do very much journaling. Really, how much can you say about my brother-in-law's handlebar mustache? Or the fake tattoo on the back of my husband's head? 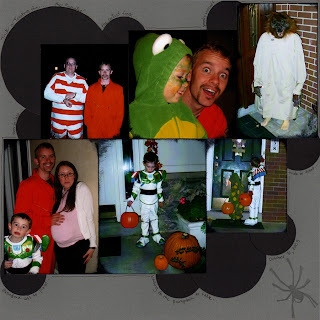 Or the fact that both my parents' sons-in-law went as inmates? Or the 'Great Pumpkin' that my parents' neighbor put on their porch that really talked to the kids? (oh yeah: speaker in the pumpkin, man in house by window talking on a microphone - technology is great!) Every time we saw a pumpkin after that, Benson and Jack thought it was going to talk to them. And my sister came as a pregnant woman. With her inmate husband. Crap. Should have done more journaling. At least the frog and Buzz Lightyear were cute! Do some hidden journaling. Or write it on the back. Then you at least have it down.